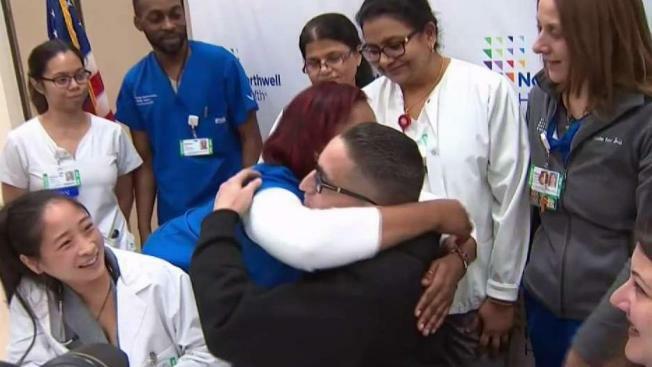 An Army veteran is thanking doctors and nurses at Northwell Health Hospital after he woke up from a coma after a month last summer. Greg Cergol reports. An Army veteran from Queens was able to thank doctors Friday for his second chance at life, months after he miraculously awoke from a monthlong coma while loved ones were planning his funeral. “They didn't give up on me. They absolutely didn't give up on me,” said Michael Mendez. Mendez came to Northwell Health (formerly Long Island Jewish) Valley Stream hospital last summer with stomach pains — a case of pancreatitis. But within days the father of two was placed on life support as his vital organs started shutting down. “I just remember feeling numb,” Mendez’s fiancée, Sarah Insolera, said. According to Insolera, Mendez’s state was so bleak the family bought a funeral plot. But a team of 36 doctors and nurses didn’t waver and stayed by Menendez’s side, hoping for a miracle. Insolera remembers that day clearly. “I jumped up. I started screaming and ran to the nurses and said his eyes are open,” she said. Three weeks later, the 46-year-old was out of bed walking on his own. “I believe he was truly a fighter — he still is,” nurse Jackie Nicholls said. Mendez’s nurses say his 15 years in the Army have made him a fighter. Mendez acknowledges his service also left him with the PTSD and alcohol addiction that nearly killed him. “I was the last guy who thought I could come out of this and even stop drinking and I did it,” he said. And if you've ever wondered if coma victims can actually hear what's going on around them, Mendez revealed he could hear the words of love and support from his fiancée who came here every day as well as his family and caregivers. “I feel we've both been given a second chance,” Insolera said.